The Colt by Breitling expresses its youthful, dynamic and winning spirit in a brand-new model dedicated to thrill-seekers. Powered by Breitling SuperQuartz movement. The ultra-light and ultra-sturdy case is made of Breitlight, a high-tech alloy exclusive to Breitling. 3.3 times lighter than titanium and 5.8 times lighter than steel, yet significantly harder. 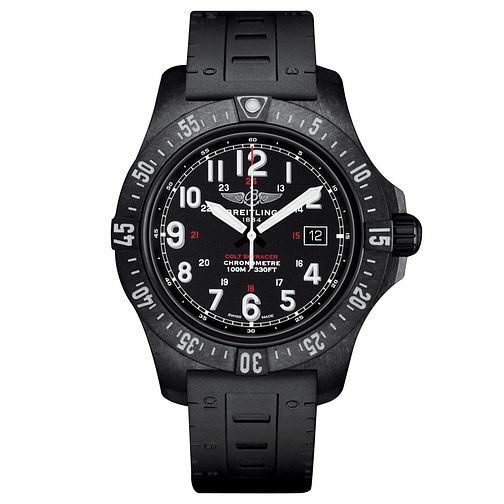 Breitling Colt Skyracer Men's Black Rubber Strap Watch is rated 5.0 out of 5 by 1. Rated 5 out of 5 by Anonymous from Breitling Great product!!! Good Price!!! !Im very happy to buy this!! !